In large nonstick skillet, combine carrot, bouillon, 1 teaspoon dill and water. Bring to a boil. Reduce heat; cover and simmer 2 minutes. Uncover skillet; stir in rice and green beans. Top with salmon, skin side down. Sprinkle salmon only with lemon-pepper seasoning. Return to a boil. Reduce heat to medium-low; cover and cook 8 to 10 minutes or until liquid is absorbed and thickest part of fish flakes easily with fork. Meanwhile, in small bowl, combine all sauce ingredients; mix well. 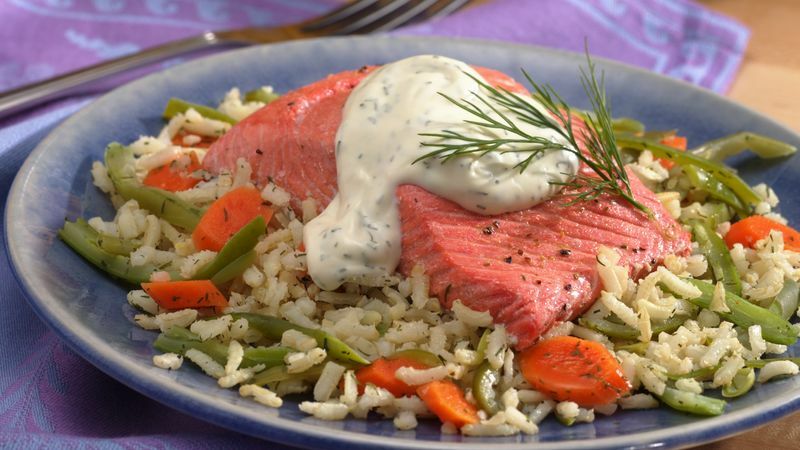 To serve, remove salmon from skillet; place on serving platter. Fluff rice mixture with fork before serving. Serve sauce with salmon. Garnish with fresh dill.